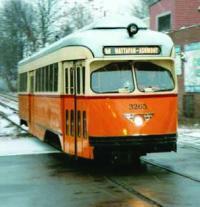 The MBTA now has ten PCC cars available for the Mattapan line, survivors of what once was a much larger fleet. The cars were refurbished in the late 1990s, but with few or no replacement parts available for some of the key components, certain pieces, like brakes and valves, are engineered, cast, and installed by skilled tradesmen at the T’s Everett Shops facility . Other, larger components – the original engines and air compressors – are routinely maintained by T workers with an eye toward preventing larger problems from becoming fatal flaws for the antique conveyances.